What Was the Parting of the Red Sea? As told in the opening chapters of the Book of Exodus, the people of Israel had been enslaved by Pharaoh. G‑d saw their suffering and dispatched Moses and Aaron to set them free. After Moses brought the 10 plagues upon Pharaoh and his people, Pharaoh finally agreed to let the Israelites go free. Following G‑d’s command, the Israelites took a circuitous route, giving the Egyptian spies among them the impression that they were lost in the desert. Pharaoh regretted having let his slaves escape and led his armies out to drag them back to Egypt and servitude. At this point, a pillar of cloud (and the angel Michael), which generally led the people through the desert, wrapped itself around them from behind, protecting them from Egyptian arrows and projectiles. At the same time, the pillar of fire illuminated the night for the people of Israel. Moses stretched out his hand over the sea, and G‑d battered the sea with the strong east wind all night, and He made the sea into dry land. According to the Midrash, at the same moment that the Red Sea parted, all the other water in the world split as well. Then the Israelites walked right into the sea on dry land, and the solidified water towered over them on either side. Seeing their prey in the middle of the sea, the Egyptians and their horses rushed in behind them, still in hot pursuit. As morning approached, G‑d turned His attention toward the Egyptians, using the cloud and fire to confuse them and emanate a painful heat. As the wheels came off their chariots, and the horses struggled in the boiling muck, the Egyptians were cast into complete turmoil. 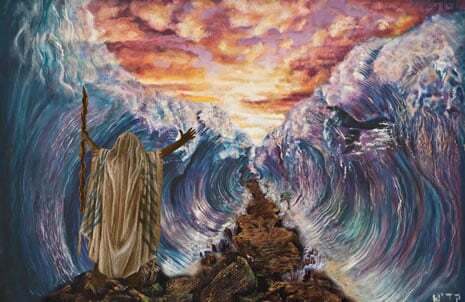 Then, following G‑d’s command, Moses stretched his hand out over the sea, and it returned to its normal state. 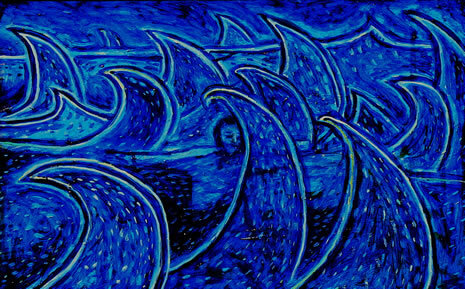 In the confusion that followed, Egyptians fled toward the sea, and G‑d stirred them into its churning depths. The Song at the Sea is so central to Jewish life that it is said every single day as part of the morning service. It is also known as Shirat Hayam or Az Yashir (“Then He Will Sing”), the opening words of the song as recorded in the Bible. 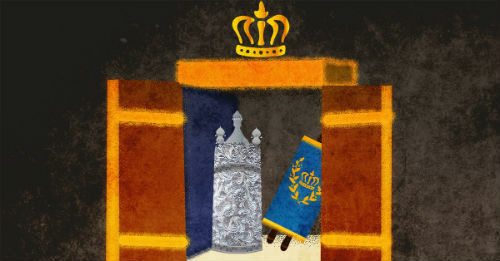 The way the Song of the Sea is laid out in a Torah scroll is unique. The text of the song is divided into small snippets, laid out to form a sort of brickwork, on an extra-wide column. Who is like You among the powerful, O L‑rd? Who is like You, powerful in the holy place? Too awesome for praises, performing wonders! You led [them] with Your might to Your holy abode. Read the entire Song of the Sea with Rashi’s commentary. The song was sung by Moses and the people of Israel. According to one tradition, the people repeated after Moses, word by word. According to another tradition, Moses sang the song, and the people called out, “I will sing to G‑d,” after every refrain. A third tradition says that the people and Moses sang every word together in perfect unison. Read more about these three approaches. We then read how Miriam, the prophetess, elder sister of Aaron and Moses, led the women in song and dance with tambourines in hand. Read more about Miriam, her faith and her song. 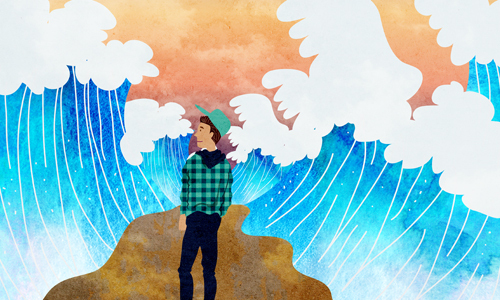 Nachshon saw what was happening—and jumped into the sea. And so it was. Following Nachshon’s lead, the Israelites entered the sea and were saved. Walking through the sea on dry land was quite an experience. G‑d spared no effort to make sure his people were comfortable. The biblical verses tell us that the seabed was dry, and the sages add that the sea walls grew fruit and spouted fresh water for the travelers. But it was more than just a watery spa. It was a spiritual delight. Tradition tells us, “What a maidservant saw on the sea, the prophet Ezekiel did not see [in his Divine visions].”5 Even the babies lifted their heads to behold the Divine presence. 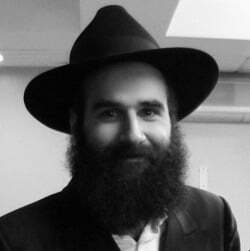 The chassidic masters take it a step further. Since water conceals everything beneath its waves, the sea represents the realm of that which is hidden, a spirituality so distant from ours that it is hidden from us. Splitting the sea and revealing the dry land on which the Jews could walk expresses the idea that the hidden realms become in some way revealed and accessible. 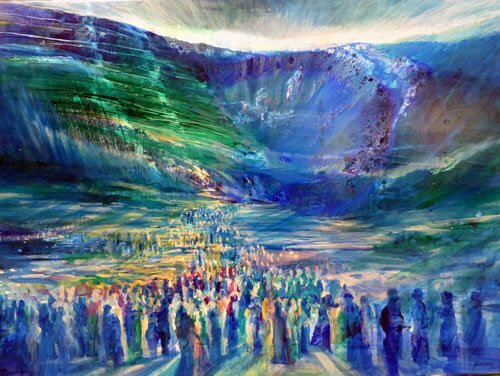 Experiencing this event had a tremendous effect on each person, and prepared them for the greatest experience of all time: the giving of the Torah at Mount Sinai, which took place six weeks later. As mentioned, the Song of the Sea has been incorporated into the daily prayer service and is said every morning before the Shema. The miracle of the splitting of the sea is then evoked once again in the blessings said after the Shema. It is also read every year as part of the annual Torah-reading cycle. The Shabbat on which it is read (generally around the holiday of 15 Shevat) is known as Shabbat Shirah (“Shabbat of Song”). Some people have the custom to put kasha out for the birds before Shabbat, or to eat kasha on this Shabbat. Read more about Shabbat Shirah. The Song of the Sea is also read on the seventh day of Passover, the day on which the sea was split and the song is sung. On that day, many people have the custom to stay up the entire night, studying Torah, recreating the miraculous revelations of the parting of the sea. Some people go so far as to pour water on the floor and dance through it. Read more about the Seventh Day of Passover. 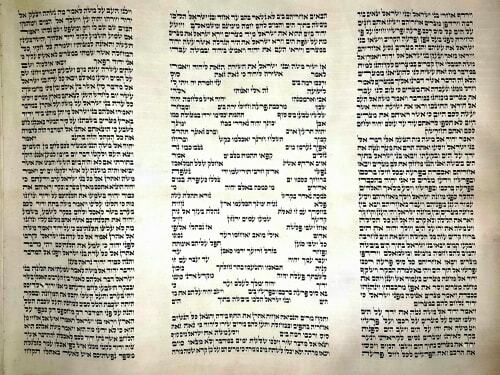 When this Torah reading is chanted, it is sung in a special, mellifluous and dramatic tune, reserved only for the Song of the Sea. As one can imagine, there is considerable speculation regarding the spot where the sea was crossed. The Talmud6 tells us that one who sees that place must recite a special blessing of praise, but does not tell us where it is, leaving us an instruction with little practical significance. There are certain everyday events that seem to us to be completely natural, or largely dependant on our own prowess or natural skill. Two examples would be having enough to eat every day and the fact that many of us merit to find a loving spouse with whom to spend our lives. The sages tell us that neither of these should be taken for granted, as they are, in fact miraculous, as supernatural as the splitting of the sea.7 What is the connection between marriage and parting the sea? To find out more, read: Split Your Sea. In telling us that the waters reverted to their status quo after the miracle, the verse says, “The sea returned to its strength.” The rabbis point out that the le’eitano (“to its strength”) can also be read, litena’o (“to its stipulation”). Much wisdom lies beneath this seemingly simple play on words. The purpose of creation was for the Jewish people to receive the Torah, which in turn makes the world into a place of G‑dly manifestation. Nothing in the world can possibly get in the way of us fulfilling that mission. And if something would do so, it would never exist in the first place. The parting of the Red Sea is recorded in Exodus 14 and the Song of the Sea is found Exodus 15. Pesachim 118 and Sotah 2a. Read the text carefully and you'll see what the sages saw. Exodus 21:14: "And he turned the sea into dry ground, and the waters were split." You raise a very important question. Why would a merciful G-d harden Pharaoh's heart and then punish him? This is a question that our people have been asking (and answering) for thousands of years. what I have learnt from such moments when we seem unable to find a way a solution, I used to Daven in such moments but I found that it was better to just Say G-d Its in Your Hands Now, I am human and have done my best now I Trust in You, as with temptation, G-d will also provide you with ability to resist if you so choose so as there is a problem or problems G-d provides us with the abilities to Trust in Him, Trust can be more powerful than prayer and maybe this is why G-d asks Moses why is he praying when he should be Trusting. Stand and wait to see, behold the Miracles, they do happen, Real Miracles but you must Trust. I always say when I am confused, I don't know what to do. This not knowing is ideal as we then allow G-d to provide the solution. Our knowing can be a hinderance as knowing implies knowledge and it didn't help Adam and Ahava. Maybe awareness is what we should seek and not knowledge.